The Hidden Glasgow Forums • View topic - Lord Provost's lamplights? 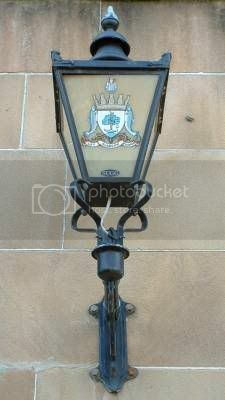 Glasgows fine first citizens the Lord Provosts, used to have a twin set of lamp lights outside there homes With the coat of arms on.I know of a few locations round the city were these can be seen.They dont look out of place in Pollokshields or the west end,I dont think that the most recent lord and lady Provosts,Kelly,Lally,Baird Mossan,Cameron have had them installed.Has Glasgow Council stoped this tradition? Can anyone help me out with locations so I can get some Photographs. There used to be some up from Hyndland Station on Churchill Drive (turn left as you come out of the little path. emmar wrote: There used to be some up from Hyndland Station on Churchill Drive (turn left as you come out of the little path. They are still there. I'll get a photo sometime, its just round the corner from where i stay. The Lord Provost's office in the City Chambers might help you trace older ones. ISTR a house in Riddrie with these, cant recall the name of the street but it was just off Riddrie Knowse. There are a couple round your way keep your eyes open! There is one at Danes Drive (directly opposite the playfields at Scotstoun Leisure centre - just as you come over the bridge from Westland Drive), when I was a postman I was always curious to find out why they where there. It is a corner house and the lights are mounted into the street outside the gate of the house. Mark wrote: There is one at Danes Drive (directly opposite the playfields at Scotstoun Leisure centre - just as you come over the bridge from Westland Drive), when I was a postman I was always curious to find out why they where there. It is a corner house and the lights are mounted into the street outside the gate of the house. That's Alex Mosson's lovely pair! That's where I grew up. We used to say they were haunted for some reason. The house wasn't haunted, but the lamps were. How that was achieved I do not know. Maybe it wasn't haunted, maybe it was something else. "Poncy", perhaps. Yes, they were either haunted or poncy. Maybe both. I should've been taking notes on my childhood, really. Sorry. hahahaa...ross...im trying to imagine how the lamposts could be haunted!! Did you imagine they could chase you...or that ghosties lived in them??? ?